With its instantly recognisable three-stripe trademark, Adidas is one of the most successful sportswear brands anywhere in the world. It’s got offices in over 160 countries across the globe and over 850 million products produced year on year: this is a company that remains at the top of its game. Now outfitting some of the biggest names in global sport including Manchester United, FC Bayern Munich, Gareth Bale, Paul Pogba and more, you’ll be joining the finest ranks when you step through Adidas’ doors. Every sport you can imagine is catered for here, you can blitz your PB with its running gear, bag yourself a hattrick with a new pair of football boots, score a hole in one with its golf attire and much more. You’re a shoe-in for athletic success no matter what your sporting ability; you’ll be able to sock it to em in all competitions big and small with these amazing products. Go team! How do I use my Adidas promo code? 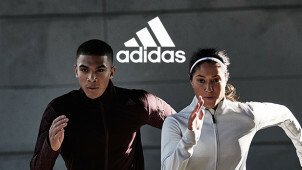 Sign up to Adidas’s newsletter on its homepage to hear about some brilliant offers! Can I get free delivery with Adidas? Very much so, if you spend over €50. Does Adidas have an outlet? You bet, it’s right here. Where is my nearest Adidas store? Take a look here to find your nearest Adidas joint. Does Adidas have a size guide? It sure does, use it here to make sure everything fits right. You can return your purchase within 100 days of receipt to receive an exchange or refund. Item must be in original conditions and packaging, with tags all attached. Contact customer services and then send product back. Return instructions depend on which provider you’re returning with, see here for full details. Be your best, most athletic and stylish self with the good folk at Adidas. A brand with a truly global reputation, you’ll be joining the elite of the elite when you shop here and buying with an Adidas promo code means you’ll be joining the money saving elite too. Be a good sport with its sportswear, join the success train with its trainers and get pleasure from your athleisure gear all here! As well as forging a strong relationship with sports stars and sporting culture, Adidas has developed a bond with the world of music. It allied with Run DMC in the 80s, resulting in the hit song ‘My Adidas’ being released in 1986. These days it has worked with rapper and entrepreneur Kanye West to release a series of Yeezy sneakers that have made waves. The next time you’re feeling the beat through your headphones, remember the words of Run DMC: “we make a great team, My Adidas and me”. Comfortable sports bras are worth their weight in gold, so be sure to get yours from the trusted supplier that is Adidas. With a range of fits and designs, including compression material, you’re sure to find something for you here and shopping with an Adidas discount code means you’ll be supported with a great saving too. Whether you’re hitting the gym, the pavement or the squash court, these bras won’t let you down!